Seymour Lake is a beautiful lake for summer and winter recreation. In using the lake there are state laws and regulations that need to be followed. Following the rules will make the use of the lake enjoyable for all. Boating is a key part of our enjoyment of Seymour, and we want to make you aware of some important information to make it more so. At the right is the cover of the Vermont Boating Handbook. It is loaded with good things you should be aware of. If you don’t already have a copy, you can get one at DMV offices, marinas or boat businesses. You can download a copy HERE. Personal Flotation Devices (PFDs) are critical to your safety. PFDs are required for each person on all boats and must be worn by those less than 12 years of age. All persons born after January 1, 1974 must have successfully completed an approved boating safety course. You can do this over the internet at www.boat-ed.com/vt. operate it only during daytime. Remember to watch for the Loons and swimmers. GET YOUR VERMONT BOATING SAFETY EDUCATION CERTIFICATION CARD IN 3 STEPS. 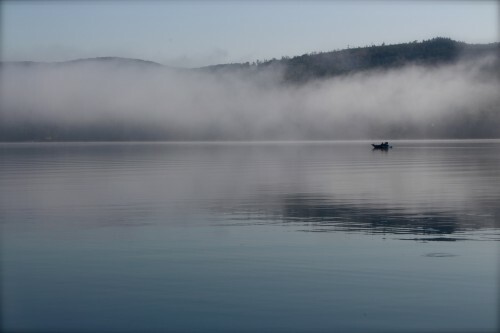 Vessels must be operated at “no wake” speed within 200 feet of the shoreline, a person in the water, a canoe, rowboat or other vessel, an anchored or moored vessel with a person on board, or a dock or anchorage. A person under the age of 12 may not operate a motor­boat powered by more than six horsepower. A person under the age of 12 must wear a Coast Guard approved personal flotation device aboard a vessel while under way and on an open deck. A person under the age of 16 must WEAR a Coast Guard approved personal flotation device while aboard a sailboard. A person under the age of 16 is prohibited from operat­ing “personal watercraft” (ski-jets). All individuals operating a personal watercraft (ski-jet) must wear a Type I, II or III United States Coast Guard approved personal flotation device. Operation of personal watercraft be­tween one-half hour after sunset and one-half hour before sunrise is prohibited. An implied consent law similar to the DWl law has been created for boating while intoxicated. No vessel may be operated within 200 feet of shoreline, a person in the water, other vessels, anchorage or docks except at a speed of less than 5 miles per hour which does not create a wake. Motorized vessels shall not be operated within 200 feet of a designated swimming area or of a divers-down flag. Specific provisions are created for designation and protection of underwater historic preservation areas. Residential use of overnight sleeping vessels is prohibited on waters lacking sanitary waste pump-out facilities. United States Coast Guard Inland navigation rules are adopted for Lake Champlain, Lake Memphremagog and Wallace Pond in Canaan. The required water ski observer must be at least 12 years old. All engines must be muffled in order to reduce operating noise level to not more than 82 decibels on the A scale at 50 feet. All Individuals born after January 1, 1974 are required to complete a boating safety course prior to operation of a motorboat. For Information about safe boating courses see links on this page. All recreational boats, canoes and kayaks less than 16′ in length must carry a type I, II, III or V wearable P.F.D. for each person on board. All divers and snorkelers shall display a diver down flag while in the water. ALL MOTORIZED VESSELS MUST MAINTAIN A DISTANCE OF NO LESS THAN 200 FEET FROM DIVER DOWN A FLAG (red with white diagonal stripe).